The bike path, the various conservation areas, strolling, and people watching, it seems that every weekend there is a craft or art fair in one of the villages, and, of course, the beaches, as long as you are a resident or do not need to park a car, are all free. 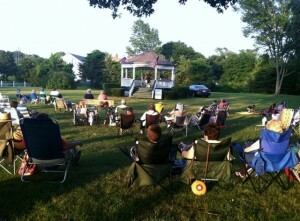 Many of thevillages offerconcerts throughout the summer. The concertshearken back to simpler time when you sit and listen to the musicians and the little kids playing on the swings on a balmy summer evening. So, if you are looking for something to do after dinner onsummer Monday orTuesday nights just go to the Village Greens in Dennis and DennisPort and enjoy! For this year's schedule, please click hereConcerts on the Greens. See you on the Village Greens!